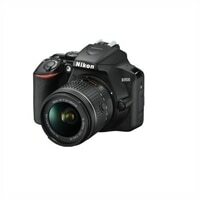 Nikon D3500 - Digital camera - SLR - 24.2 MP - APS-C - 1080p / 60 fps - 3x optical zoom AF-P DX 18-55mm VR and 70-300mm lenses - BluetoothYou don't need to be a photographer to know a great photo when you see one. And you don't need to be a photographer to take a great photo - you just need the D3500. It's compact, durable and versatile, ideal for travel. And it works seamlessly with compatible smartphones, making it easier than ever to share your great photos. You don't need to be a photographer to know a great photo when you see one. And you don't need to be a photographer to take a great photo - you just need the D3500. It's compact, durable and versatile, ideal for travel. And it works seamlessly with compatible smartphones, making it easier than ever to share your great photos.